Pelenna Patchworks: Moda Indigo Crossing jelly roll and layer cake now available! 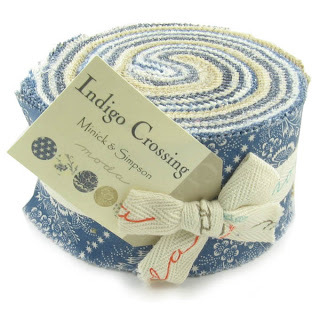 Moda Indigo Crossing jelly roll and layer cake now available! This month's Moda jelly roll and layer cake has arrived - stunning indigo and white prints from the Indigo Crossing range by Minick & Simpson, along with coordinating tan and blue prints, this will make up to a lovely, fresh finished article!